This week’s Early Childhood Family Education (ECFE) topic was “The Problem of Praise”, an in depth look at the perils of employing praise to reinforce desirable behavior with children. The instructor, a Ph.D. in early childhood education, walked us through a discussion on the major research that demonstrates, among other things, that continuous praise (“Well done!”, “Good job!”, “That is so special!”) can actually lower a child’s desire to strive for achievement. 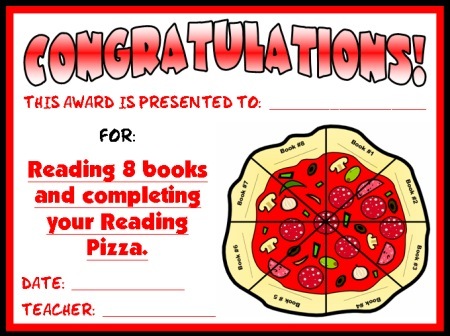 Citing a study on the ubiquitous elementary school “Book It” program sponsored by Pizza Hut that rewards children who read books with free meals from the national pizza franchise, our class learned that the program actually decreases a student’s love of reading. Rather than read for reading sake, as one might expect, continuously rewarding the accomplishment of finishing a book led children to seek pleasure not in reading itself but in the prize or the attendant praise. Far from completing increasingly more and more difficult books, children in the study were found to read below their competency in order to achieve more points, and thus more rewards. Research shows that when we are praised our brains literally release small amounts of dopamine, a chemical in the brain that heightens our sense of pleasure. Dopamine is directly related to learning in that whatever brings us pleasure we are bound to repeat – and repetition leads to mastery and confidence, both of which increase our sense of pleasure and the cycle continues. What studies have shown is that too frequent praise undercuts the learning process by locating the pleasure in the experience of approval, not in the joy of discovery. Children who are repeatedly praised, one study showed, were more likely to quit tasks at which they first experience failure or that didn’t come as easily. Instead, children who were in some sense hooked on the dopamine produced by praise tended to focus on tasks and activities that they were better at and which garnered them more congratulations. All of this may come as no surprise to you. In fact, many of you who have raised a family (or participated in ECFE) will know this as though it was second nature. So why, you might ask, am I writing about it here, particularly in a forum usually dedicated to theological reflection and spiritual insight? In my time as a spiritual leader in the church, I can’t tell you the number of times people – learned and accomplished people, good people – have told me “I’m just no good at spiritual stuff” in the same way I used to tell my parents in junior high “I’m just no good at math.” When a conversation turns to matters of prayer, devotion, experiences with God, and spirituality, these folks will insist that they have nothing of substance to contribute, and most of the time they’re right. Unfortunately no one has ever insisted with them that spirituality and prayer takes hard work and time, the same way your parents and mine insisted the same about math and reading. “So what if you’re not good at math” my dad responded “stick with it and you’ll get better.” He was right. I’m no astrophysicist but I’ll be able to help my son Jude with his pre-calculus homework some day. And, far beyond this, the pleasure I experienced at one new discovery in math in high school far outweighed a dozen compliments I ever received for a poem or an essay. Of course the comparison of learning to spirituality isn’t a simple one-to-one correlation, and our life of faith isn’t just about “getting better.” But, there is enough from one that maps onto the other that we ought to pay attention. Lent is a time when the church calls each of us as followers of Jesus to deepen our devotion and to pay special attention to the life of the spirit. For most of us (and I include myself here) these things do not come naturally or easily, and there will be little external praise when we do persevere and arrive at new insights and encounters with the Holy. But the reward of these insights and encounters is far too valuable to be forfeited just because we’ve told ourselves we aren’t spiritually gifted. If our experience of educational growth is true, the encounter with the Holy and the spiritual learning itself will propel us to further exploration and prayer, to further devotion and listening, and ultimately to a love, not of praise for our accomplishments, but of the God of our encounter, the One to whom all praise is worthy and with whom is true joy. If you’d like to read further about the research mentioned above, please read this excellent article in the New York Magazine from back in 2007. Curiosity, voyeurism, the occasional thought-provoking reference: these are the main reasons I check into Facebook once a day. I also appreciate hearing what friends are doing and, in some cases, thinking. I like the pictures, too, and seeing aspects of friends’ lives I wouldn’t otherwise, although the need to share a close-up of the Chicken Supreme they had for dinner last night escapes me. However, too often I end up in Facebook Fury, hooked by a posting someone has leeched from some source or other, that makes me want to bring out the big guns and shoot it dead. (Already I’m talking guns, just thinking about it.) I want to, at the very least, smash the argument to smithereens and kick it to the curb. This being Presidents’ Day, I couldn’t help but contrast the polarizing, cheap-shot, historically-questionable Dark Ages comment to what I was hearing on Public Radio: Historian Doris Kearns Goodwin’s words about Abraham Lincoln. She wrote a premier biography of Lincoln, tellingly entitled Team of Rivals. She discussed his humanity, his struggles, his sense of humor, the compassion he held even for his adversaries. I started poking around in my sermon file and found one of my favorite references, which happens to pertain to Lincoln. It embodies a spirit we need desperately in the church, the country, and the world. It is the opposite of the appalling polarization in our political discourse, fueled by irresponsible politicians who value their own agendas over human progress. Classy, Christian, and the spirit that could actually get us somewhere. As much as I like to argue (and win), I know that THIS is the path to which we are called. I think I’m going to paint my living room red. Not a crass, fire-engine red or patriotic red, but more of a rosy, brown-tinged red. I’ll know it when I see it. I can’t wait to go to the paint store today to get the color charts. I’m painting because it’s February. Not the easiest month: taxes; grey landscapes, Valentine’s Day hype, dirty cars, and the disciplines of Lent looming. We strive to ignore the countless clichés that clutter the consumer culture: the heart-shaped pizza, the St. Patrick’s’ Day shamrocks sported by elves (no wait…. they’re with Santa. I guess it’s leprechauns), and the pre-Lenten pastel bunnies that all delude us into thinking we’re in the midst of one big, ongoing party. Forget about the heartstoppingly-clueless politicians and the Fall Fashion Shows (yes, they have them NOW). “God is in the details,” someone said. In February, we need to make a point of seeking out beauty because it can be more elusive than in, say, June. Go for the color. Do something tactile. Buy some tulips. Paint the living room…AND the dining room. The most stirring examples in our Scriptures of God’s concern for the world are often in the micro, not the macro. Jesus didn’t perform mass healings, waving his arms and declaring, “You’re all well now. Have a nice day.” Rather, he healed individuals, one by one. Tenderly touching the eyes of the blind, lifting up those anguished with fever; commanding “evil spirits” to leave a tortured body. Jesus healed those who got close to him. Although getting close to God through the external and internal macro-landscapes of February can be challenging, seeing God’s work in the micro and the details is easy. “Beauty is the way God heals his broken children,” someone observed. And in February this beauty is everywhere for the attentive eye. It’s in the wall of flowers at the grocery store; it’s in the sun that peaks through the clouds unexpectedly; it’s in the ringing bells and the soaring voices of the choirs last Sunday as they asked, ”How Can I Keep from Singing?” It’s in the faces and dedication of those caring tenderly for the guests at Project Home. How appropriate. Even in February. “What is your final destination?” asked the glowing blue sign as I dashed down the carpeted concourse toward my gate. I thought my eyes were playing tricks so I turned back for a closer look. Sure enough, in the center of the display was what looked like a yellow road sign and a figure kneeling in prayer. The bottom of the sign indicated that this was an ad for the Atlanta International Airport Interfaith Chaplaincy. It seemed at first blush to be playing into the notion that religions, no matter their stripe, are really just tickets to the afterlife – a play on the question “where are you going when you die?” Such a rendering of all faiths (after all the sign did purport to be “interfaith”) as being about pie in the sky left me a little frustrated and I turned on heel and continued toward my gate. “My final destination is home.” I said to myself. We were about to board our plane back to St. Paul, and I couldn’t help the feeling that though we had only lived here for 6 months, we were in every way returning home to our place and our community. Back home was the house we had just purchased, a church we had come to love, and our new life. I was going home. And, as I fumed for a moment over the silly sign, I couldn’t help thinking that this was what had me so frustrated. That so much religion geared toward the afterlife has us overlooking the very real destinations in which each of us live and move and daily have our being. Looking to the hereafter can cause us to overlook the here and now. Still, whatever the impulse behind the message on the sign, it did seem to get one thing right. The question of a destination implies, at least to me, the existence of a journey. As a person of faith I do affirm that my life, especially my life in faith, is a journey sometimes toward and often away from the source of all life and faith. My final destination, my ultimate home, is not a place or a realm but a being whom we have come to know in the person of Jesus the Christ. My home is in God. And God, our faith affirms, is known in the here and now, in the present realities of our daily life. God is known in our community called the church, at St. John’s and beyond it in our everyday experiences. God is with us every step of the way of this journey – from our beginning to our ultimate end and everywhere in between. As a pre-teen at St. James Lutheran, I looked to these sophisticated high school girls with admiration, and dreamed that some day I would be able to display this ultimate badge of femininity and lovability: the corsage. As an awkward twelve-year-old, I wanted this so much it hurt, and the sheer thought I would not be one of the lucky girls “chosen” was devastating. I had reason to worry. Tall and gangly, funny and witty (so I was told), I was usually the one the boys wanted as their pal, not their girlfriend. I had plenty of boy time, not as much date time. As a senior, one big victory was wrangling a date to the Junior-Senior Prom. He was an older boy from church (of course), hardly a dreamboat, but willing. And the corsage? An orchid. An orchid! In the early Sixties, orchids were not the queens of the flower kingdom, as they are now. They didn’t even seem to come in the same colors then. In fact, single blooms were often sold at the grocery store in little plastic boxes before Mother’s Day. You could pick one up for three bucks and bring home to Mom so she could — what? WEAR IT AS A CORSAGE TO CHURCH on Mother’s Day. The lucky mothers, of course, wore roses. Corsage classicism, I suppose. Pale, whitish with a brown center and a few pink ribbons hanging down that clashed with my reddish dress, the Prom corsage screamed “generic” but at least it was a flower and it was given to me by a boy. I knew it wasn’t from the grocery store because it came in a florist’s box and Mother’s Day was long gone. Yet it had that same joyless look. And yes, even though it was a wrist corsage, I pinned the rapidly-fading thing to my coat and wore it to church the next Sunday. One reason I like to play with memoir is that, given some distance from the earlier events of life, I can see them without the emotional intensity of the time distorting them. The poet William Wordsworth wrote that ”Poetry is emotion reflected in tranquility.” I think this means that we are often unable to truly comprehend the importance of an experience until later, when we are able to reconstruct the event in our minds in a calmer way than when we are living it. Our faith calls to such thoughtfulness. It is important spiritual work to remember and reflect. When people ask “what to do about their spirituality?” this is one thing to do. Listen up! When I do this kind of intentional reflection, almost always I see the figure of God there in the background – even at St James Lutheran — and I am able to detect the grace notes that tinkled in the background, though I couldn’t hear them then because I was so overwhelmed, flooded by yearning, envy, cautious hope. But now I can see the envious twelve-year-old in the pew with tenderness and compassion, as I suspect God saw her then. I know now she was loved indeed. So today I remember that I have been given a lot of flowers (yes, even some corsages) over the years and I have bought a lot of flowers for myself. I’m thrilled every time I get them, perhaps an echo of those early times when flowers were the insignia of being loved. Now it seems that orchids are the new Baby’s-breath, that wispy flower that was part of every trendy flower arrangement through the 90’s. The Department of Agriculture says that today orchids are the second-most popular potted plant, right behind poinsettias and ahead of chrysanthemums. I have a luscious purple orchid plant on my desk today, a loving mid-January birthday gift from my daughters. It’s a beauty and I smile when I look at it, remembering ……. blessed. I performed the Heimlich Maneuver Monday evening — on myself. Lurking in the “string beef” from Trader Joe’s I had slung on top of some lettuce (therefore making a “salad”) was a chunk the size of a tennis ball that managed to lodge in my throat. I drank water, gagged, tried to cough, got more and more panicked, and wondered if I should call 911 (wouldn’t get here in time) or run to the neighbors (how embarrassing but passing out would be, too). I couldn’t breathe. I remembered that people die this situation. I’d seen it in the movies. Nothing was working, so I made a fist and put under it my ribs, then hit it reallyhard with the other fist, and lo, the hideous thing popped out. Realizing what could have happened, I broke down in tears of relief, vowing to become a vegetarian, to cut my food in tiny pieces, to be a better person, etc. Both kitties sat at my feet, concerned in their way. Research nerd that I am, I went to the computer and learned that you could choke to death in four minutes! Among the things that happen automatically in our bodies, perhaps none is more basic and miraculous than breathing. Our faith concurs, and says that that the source of our breath is the Creator. In Genesis, by breathing into the nostrils of Adam and Eve, God gives them life. Jesus breathes on the disciples and gives them the Holy Spirit. We die when breath leaves our bodies. Breath is a revelation of God, and a connection with God. When something as innocuous as barbequed beef can block our airways and deny us breath, there are other things that also block our connection with the Sacred: fear, anxiety, unrestricted criticism, inattention, laziness, self-pity. To breath the air, how delicious! To speak, to walk, to seize something by the hand! Breath: as with so many gifts from God, especially precious when you might lose it. Deep breath now. Exhale slowly. Give thanks. Don’t wait until your equivalent of the barbequed beef forces the issue.